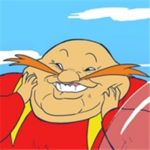 Eggman the Dictator in Sonic the Hedgehog (aka Eggman in Sonic 1) is a rather interesting hack of Sonic the Hedgehog made by L0st - Sonic is replaced by Eggman, who runs through the stages. Due to Eggman's larger sprites, the mappings and collision engine were rewritten from scratch, and Eggman also jumps at the same height and runs at the same speed, above and below water. As a result, Eggman cannot collect rings, open item boxes, destroy enemies, be hurt by objects or drown—the only way to kill Eggman is by landing on spikes, getting crushed, or falling off the screen (all three of which require a reset). Because of this, the hack is little more than a novelty, but is an impressive one nonetheless. Eggman can't use debug mode either, but Level Select still works. Also the Special Stages are unchanged, as Eggman can't enter Special Stages from the main game.